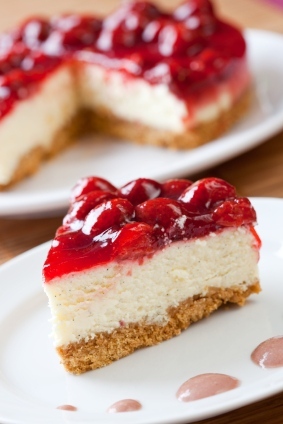 Do you want to learn how to make a cheesecake from scratch? I have simple instructions that will guarantee a perfect cheesecake every time. These tips and recipes are from from Dorie Greenspan's cookbook; Baking: From My Home to Yours. Along with chocolate chip cookies, apple pie and brownies, on dessert never wanes in popularity; the all-American cheesecake. 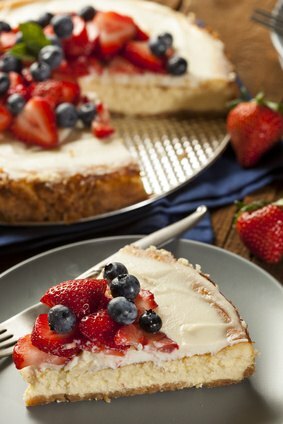 If you want to learn how to make a cheesecake - this recipe is an for an all-American cheesecake. The big, beautiful, lush and creamy variety, the kind that causes gasps of delight when you bring it to the table and sighs of satisfaction when you and your guests savor bite after bite. It’s also a cheesecake you can customize. You can make the cake milder or tangier by using all heavy cream or all sour cream, or a combination of the two. You can add fruits or nuts, swirls of chocolate or drops of extract. Learn how to make a cheesecake with this basic recipe. Butter a 9 inch spring form pan - choose one that has sides that are 2-3/4 inches high (if sides are lower, you will have batter left over). Wrap the bottom of the pan in a double layer of tin foil. Turn the ingredients into the spring form pan and use your fingers to pat an even layer of crumbs over the bottom of the pan and about halfway up the sides. Don’t worry if the sides are not perfectly even or if the crumbs reach slightly above or below the midway point on the sides. Center a rack in the oven, and place the spring form pan on a baking sheet. Bake the crust for 10 minutes. Set the crust aside to cool on a rack while you make the cheesecake. Put a kettle of water on to a boil. When you are learning how to make a cheesecake, working with a stand mixer is preferable fitted with a paddle attachment, or with a hand mixer in a large bowl. Beat the cream cheese at medium speed until soft and creamy; approximately 4 minutes. With the mixer running, add the sugar, salt and continue to beat another 4 minutes, or until the cream cheese is light. Beat in the vanilla. Add the eggs, one at a time, and beat a full minute after each addition; to get a well aerated batter. Reduce mixer speed to low and mix in the sour cream and/or heavy cream. Put the foil-wrapped spring form pan in a roasting pan that is large enough to hold the pan with some space around it. Give the batter a few stirs with a rubber spatula, just to make sure that there is nothing left unmixed at the bottom of the bowl. Scrape the batter into the pan - it should reach the rim. If you have leftover batter, bake it in a buttered ramekin or small soufflé mold. Put the roasting pan in the oven and pour enough boiling water into it to come halfway up the sides of the spring form pan. Bake for 1-1/2 hours or until the top is browned and may have risen just a little above the rim of the pan. Turn off the oven and prop the door open with a wooden spoon. Allow the cheesecake to luxuriate in its water bath for another hour. After 1 hour, carefully pull the setup out of the oven, lift the spring form pan out of the roaster and remove the foil. Let the cheesecake come to room temperature on a cooling rack. When it is cooled, cover the top lightly and refrigerate for at least 4 hours; overnight is better. At serving time, remove the sides of the spring form pan (I use a hairdryer to do this) and set the cake on a serving platter. Now impress your family and friends on how you learned how to make a cheesecake. Replace the graham crackers with chocolate wafer cookie crumbs. Depending on the filling you’re using, you might want to add a pinch of cinnamon, nutmeg or ginger (or a touch of all three) to the mix. Replace the graham cracker crumbs with gingersnap cookie crumbs. I like to use this crust with the Coco-Nut Cheesecake (recipe below). Add 1/2 cup toasted shredded sweetened coconut to the graham cracker mix. Add 1/2 cup toasted and finely chopped nuts - almonds, pecans, walnuts or even macadamias to the graham cracker mix. Add the grated zest to two lemons, the juice of one lemon and 1/2 teaspoon of pure lemon extract to the batter. Add the grated zest of two limes, the juice of both limes and if you have it, 1/8 teaspoon of pure lime oil to the batter. Add the grated zest of one orange, the juice of the orange and 1/2 teaspoon of pure orange extract to the batter. Add 4 ounces of bittersweet chocolate, melted and cooled, to one third of the batter. Now you have a choice: To make Marbled Black-and-White Cheesecake, pour all of the vanilla batter into the spring form pan, dollop the top of the batter with the chocolate and use a table knife to swirl the dark batter through the white. To make a Layered Black-and-White Cheesecake, pour half of the white batter into the pan and spread it evenly with a spatula, then top with the chocolate batter, spreading it to the edges of the pan; finishing with the white batter. Both of these are wonderful served with a drizzle of chocolate sauce. Pour half of the batter into the pan, drop in 1 cup fresh blackberries, raspberries, blueberries or a combination of berries (except strawberries-they are too watery), and top with the remaining batter. Alternatively, you can very gently fold about 1 cup of small berries into the batter, taking care not to crush them and color the batter. By now I'm certain that you will be able to show someone else on how to made a cheesecake...a perfect, refreshing cheesecake.